As a boy my ‘Dinky’ & ‘Corgi’ toys were mainly American badged and I wish I had them now, especially the Cadillac Ambulance with its flashing red light, and the ‘McCleans’ Mack Semi with rear opening trailer doors. My 1959 Chevrolet Gullwing Taxi still survives on my sons shelf in the bedroom, as does an AMX Javelin, amongst the dream cars of Bughatti, Lomboughini, and Ferrari, to name a few. In the seventies I emigrated to Australia, where straight sixes and V8’s were the norm, and it was time to get to grips with some Holden and GM products. First was a Holden Kingswood, straight six, a good family car, but two a penny in Oz. 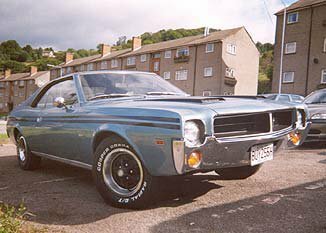 I then got into the car trade selling for a Ford dealership and within 6 months I had probably driven most of the range 351 Landau Coupes, XA, XB, C’s and even the Cobra that was featured not so long ago. I moved to a Honda dealership and worked with an American guy for about a year. Although we were selling new Honda’s a few gems came in as trade-ins, even a Mack Prime Mover, which I had to ‘shop’ around the trade as no-one else had a license. One of the gems that I bought was a limited edition Holden Monaco, finished in a burgundy red, with gold honeycomb wheels and pin-striping everywhere. The 302ci motor was really sweet, and it had all the interior fittings of the up-market Caprice, only five or six hundred of these were assembled and today command high prices. I then travelled to the States after my Monaco was stolen, and I had been paid out. There I was lucky enough to drive an anniversary Trans Am, L82 Corvette, 66 Mustang, and a 80’s Cadillac to name a few. So when I returned to Oz three years later I found myself a very nice 1971 Rambler Matador Wagon. It was great for business as I’m a ‘Brickie’ by trade, and pleasurable as you could get a good nights kip in the back if you were on your travels. Although it would appear from a lot of American car owners that A.M.C. products, are like the ‘Lada’ of the American scene. I cannot talk bad of them having had two Matador wagons, a Matador X Coupe, an Eagle Limited Edition 5 door wagon, the SX/4 3 door version both of which are constant 4 W.D.’s, and now what appears to be a very rare 1969 Javelin SST with ‘Go-Pack’ in RHD guise. Apart from 50 which were sent to Oz in 1969 in ‘knock down’ form BUY 255H is the only known RHD in the UK. It was sold new at a Rambler, Lotus, Marcos Dealership in Stourport near Kidderminster, Worcester in March 1970. The first owner had it many years and even had it resprayed, which was a million miles away from its original Beal Street Blue Metallic. He later passed away and the car was sold to its second near Droitwich who had done the brakes and some interior work, and it was sent for an MoT in June ‘02, which it failed on half a dozen minor things. I then took possession of the Javelin in Oct ‘02 and some original MoT’s and bills along with the MoT failure sheet which confirmed that the car had only done 1100 miles since February 1981. The Speedo now reads 58,000 miles and after some fresh paint and a decent set of 225x70x14 Cooper Cobra’s, I took the car to its first show in Bristol where it took its first trophy. Originally built at the Lakeside plant near Milwaukee, Wisconsin “The land of Milk and Beer”, top A.M.C. aficionado's do not really know exactly what A.M.C. did and in fact mine still wears the Rambler badge on the front grille.